Traditional and authentic Restaurant that promotes Albanian cuisine. 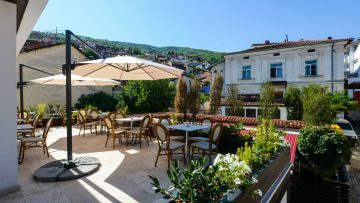 Hotel Tiffany provides comfortable stay at the city of Prizren , also traditional and authentic food at Restaurant Tiffany. Superior rooms built to the highest detail and with high quality. Each room is equipped with: air condition, wifi, smart tv, minibar, safe box etc. It also contains two bedrooms for two persons each, nice lighting and a view to the old city, new bathroom, all with a reasonable price. Twin Room is a highly qualitative built room, contains two bedrooms and it's also equipped with air condition, wifi, smart tv, minibar, safe box, etc. The room also has nice lighting and a view to ancient part of Prizren, new bathroom for a reasonable price. Superior Double Room is truly a high quality superior room and it also offers uncommon working environment. Our environment is also suitted for business meetings, dinner gathering or product presentations, in which your guests can also have a chance to visit the old and beautiful city of Prizren, visit some ancient architectural monuments and also try traditional foods at Tiffany Restaurant. Uncommon and superior enviroment in the center of Prizren and only 45 minutes far from Prishtina Airport. 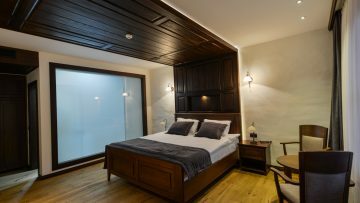 Tidy rooms equipped with air conditioner, WiFi, Smart TV, minibar, Safe Box, and many other things which make Hottel Tiffany your permanent choice in Prizren. 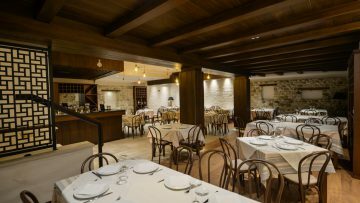 Restaurant Tiffany is a traditional and authentic restaurant which promotes Albanian cuisine. The quality of food, its special taste, home feeling enviroment and inherited recipes from past generations, are factors which make Tiffany one of the most preferred restaurant.